Bodyguards excel at defending both people and places. They tend to be highly capable with all kinds of weaponry, extremely tough and savvy in combat, and exactly the right people to get behind when blaster fire starts flying. 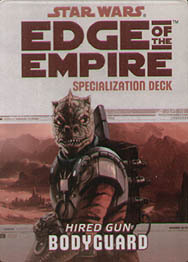 This deck requires the Edge of the Empire Core Rulebook and includes cards for all 20 talents available in the Bodyguard specialization.